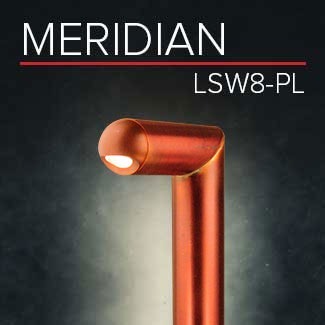 Auroralight Announces New LSW8-PL Luminaires – Auroralight Inc.
(CARLSBAD, CA – September, 2018) Auroralight, manufacturer of the world’s finest solid copper and brass landscape lighting solutions is pleased to introduce the new LSW8-PL luminaires. This path light is based on our popular LSW8 Meridian Step/Wall Light. Designed specifically for situations when there is a need to continue lighting a pathway where there is no wall or other structure available to mount the traditional LSW8. The LSW8-PL is an ideal solution for uniform spacing and light levels in the absence of a structure. Its small aperture effectively shields against glare while allowing for excellent forward projection with even illumination side to side. Pair with our LSW8 step/wall light for design continuity throughout your project.